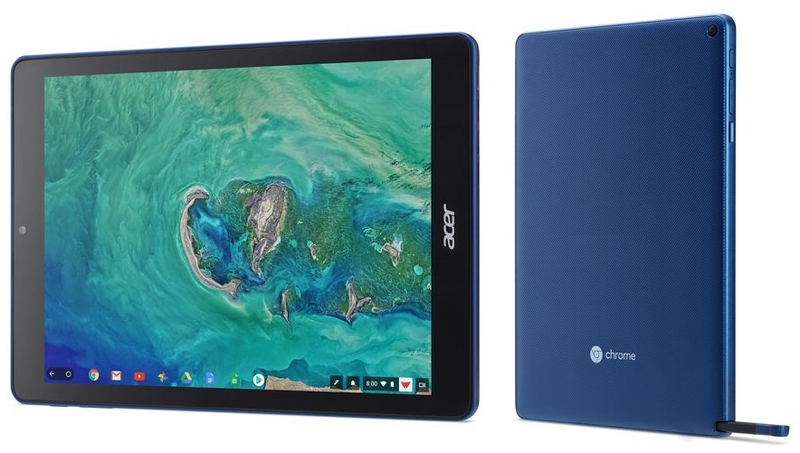 Acer’s Chromebook Tab 10 is very much meant to rival the iPad, and that’s particularly notable since it’s being announced just one day before Apple is supposed to announce a new low-cost model. The Tab 10 has a 9.7-inch, 2048 x 1536 display — just like the iPad — with front- and rear-facing cameras, an estimated nine hours of battery life, an OP1 processor, 4GB of RAM, 32GB of storage, and a USB-C port. There’s also a microSD card slot and a headphone jack. But what’s particularly notable is that the Tab 10 also has stylus support; like Samsung’s Galaxy Note series, the Tab 10 even has a small stylus built right in. It’s a Wacom-branded stylus, and it doesn’t require a battery or any additional charging. Screwy name: Chromebook Tab 10. With that pen, it would have been a natural to call it the ChromeOS Slate or ChromeSlate. Will put this on my Fondle List for next month. I’m not optimistic. Android emulation isn’t mentioned. And even if it was in there, there’s no longer any good, fast-as-hell PDF app now that SmartQ Reader is dead. This entry was posted in Android, iPad Format Clones. Bookmark the permalink.